Tikadiya is a masala paratha from Rajasthan where the chapati is made with a mix of spice powders and cooked over a griddle. This is mostly served with a mild Rajasthani Dal or Gatta Sabzi. I had made this Tikadiya when I did my Rajasthani Thali. I based all my dishes from Vaishali and ensure the thali was well balanced. This Tikadiya was served with Paneer Gatta and Rajasthani Dal. I had a couple of Indian Flatbreads that were done ahead of time because of the thalis I had made then. While making a thali is quite a laborious process, one ends up with lots of dishes that you can plan it over many months. I was really glad I had made it ahead as it sure saved me a lot of time. Come to think of it, this masala tikadiya is similar to the Masala Paratha except lesser spices being used. This surely goes very well with bland dals. While I had done this ahead of time, I had other T’s that was noted down like Tikhat Mithachi Puri, TandLachi Bhakri etc. Tikadiya was my choice for T, in the AtoZ Flatbread and More, where I am making AtoZ Indian Flatbread. 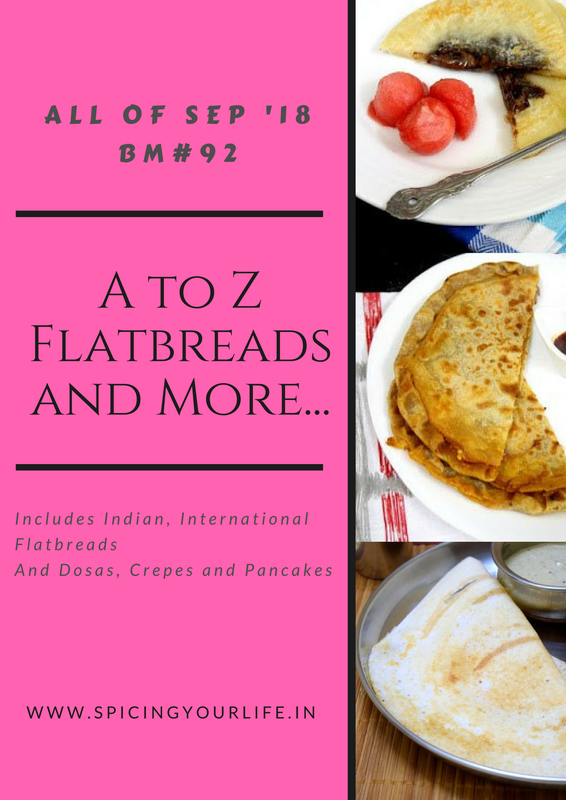 If you are interested to know what’s for T in the AtoZ Dosa Varieties, hop over! Take the flour and salt in a bowl and knead to a soft pliable dough. Pinch out equal sized balls and dust well before rolling to a 9 inch chapati. Mix the red chili powder with cumin powder and a pinch of salt. Apply all over the surface and sprinkle the spice powder over it. Using your fingers, spread this evenly on the top. Starting from one end, tightly roll inside. Once you get a rope, cut into 1/2 inch circles. Dust well and again roll into a chapati. Heat a tawa and cook this on both sides with cooking oil/ghee. If you want to keep this vegan, use just the oil. Such a unique paratha! Love that style of rolling it…and looks like you have also got on to the thali bandwagon. So stunning!! Love it!! Love the spice mix went in this Tikadia, cant wait to give a try to this flavourful paratha, and that thali looks absolutely droolworthy. Everything looks just prefect and satisfying for me. I love layered chapathas it is quite interesting to make and deliciously flaky. The addition of spice powder makes it so inviting. I can have this plain with a cup.of tea. It sure is a blessing to do a Thali , it helps you to save so much time when in you are short of time . Rajasthani Tikadia is a simple bread but tastes awesome with any curry or on its own too . wow… this looks so flavorful bread.. simple too tasty with any curry. An interesting roti, spreading a bit of masala and rolling it up. Doing a thali has its advantage, besides been an absolute treat, you can have many recipes all in one plate. Awesome thali Srivalli. Yum and delicious. Love your method of preparation. I make it slightly different generally a quick fix when I don’t have vegetables to go along. What a lovely masaledar paratha this is. Vaishali’s recipes cannot go wrong and I am drooling at your Thaali. I definitely need to learn planning from you and Vaishali! Such a nice thali and an even more delightful flatbread to bookmark! hats off to your google search that for letter you had choices. I was kind of stuck two times badly and waited for your posts to get the idea :)))). Tikadia bread looks great with this yummy and nicely done thali. true making thalis is a laborious task but worth for sure.